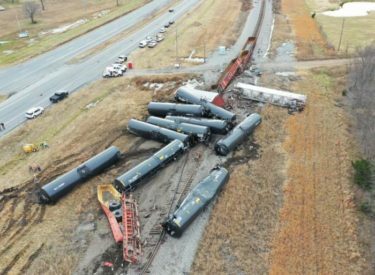 McALESTER, Okla. (AP) – Federal and state agencies are investigating the cause of a train derailment in southeastern Oklahoma. Authorities say 16 railroad cars and a locomotive of a Union Pacific freight train derailed about 6:30 a.m. Sunday in a rural area north of Kiowa, about 105 miles (314 kilometers) southeast of Oklahoma City. No injuries were reported and no hazardous materials were released. Union Pacific spokeswoman Hannah Bolte said Monday that nine of the railroad cars were empty. Officials say the others carried steel, grain, and beer. Union Pacific says the train originated in San Antonio and was headed for Kansas City, Missouri. Bolte says the Federal Railroad Administration is leading the investigation into the cause. Railroad crews are working to remove the damaged rail cars and repair the tracks.